This is a postcard of a gasoline/filling station in Oberlin, Kansas. 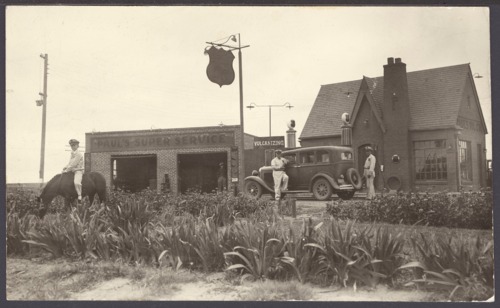 The man on the horse is unidentified, Fred Walton is standing next to the car, and Lyle Walton is pumping gas. Based on the shape of the sign, it appears to be a Phillips 66 station. There is also a sign for "vulcanizing."